I only read this thread by chance . But yeah, that link above (especially my long post towards the end) pretty much sums up my experience with the Jim Berry clutch. It's great! And I'd actually be interested if Jim is still doing them - because he semi retired. I was scared off Exedy by the very big reduction in quality that people reported years ago. But maybe that's been resolved now. If you never launch the car hard from a start, with eg. LaunchControl as part of a tune, the stock clutch is probably more than fine around 200kW. I didn't have any issues with my stock one until I started doing hard launches. Just caught up replies thanks guys. I will never go above 220kws atw in this car and although I rarely launch, occasionally I will. Both Subaru workshops I have spoken to in QLD recommend an NPC for a HD. They are custom made use the Exedy plate and they upgrade the springs and material. 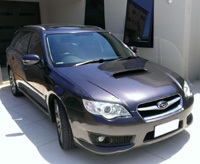 I have a mate who has one in a MY08 STI impreza so I will take his for a drive. From the estimates it will cost me around $500 more for a NPC HD over OEM. About $300 more than a Exedy HD. Ok, that sounds good! Similar to what Jim Berry does, except he modified a german Sachs plate. And since they already upgrade the springs, you can probably ask for similar pedal pressure as stock (that's what I did), or higher if you prefer that. I enjoy having a HD clutch that feels stock when I'm in traffic, while still being able to handle launches. Just to throw another option in there... I've just put a Mantic Stage 2 clutch in mine (after some convincing from people on the club.liberty Facebook page). Thoughts on it so far - shudder in 1st gear (apparently it might take 500km or so to bed in). Almost thinking I should have gone stage 1 for something softer, but I had been told the power my car was putting out would be about the limit for the stage 1, and the stage 2 would be a bit more heavy duty (a step up from Exedy HD with similar pedal feel I believe). Well I ended up with a Exedy HD - by accident. In the end I actually decided on a standard clutch but the workshop stuffed up and fitted a Exedy HD which I didn't find out until the job was done. That was 3 weeks ago and I am used to it now but all I can say is it is heaps heavier than stock with very short pick-up and when I drove out of the workshop I hated it (and stalled it). Same material as OEM Exedy, just 40? pound more spring pressure = a lot. It is actually good to drive now but requires more control when balancing the clutch at take off and slow speeds - reversing hills etc. No shudder, noise or anything negative besides how heavy it is. On a positive note when it clamps that clutch aint slipping. Oh ok . Hopefully you don't do much city driving. What I don't understand is why clutch manufacturers still make the pedal pressure so heavy to seem 'sporty'. By changing the pivot point, they can easily get big increases I clamping force with no increase in pedal pressure. Jim Berry clutches are a good example - same pedal pressure as stock but a LOT more clamping force. I do like a heavy pedal, just not when daily driving. Tom, I also fit the Group-N gearbox mount at same time and no issues with NVH. I did notice some vibration through the clutch pedal and a couple of small noises which subsided so must have settled in. Ok, sounds good Tim. I have the STi Trans Mount (in between stock and Group N). I loved it until the car was driven a lot in Brisbane (we're moving there next year). The roads there are so unbelievable smooth, that the slight transmission whine is really noticeable now. It was great for years in North QLD. I've ordered a new stock Trans Mount, and will see which one I prefer. Being heavy duty they need a good thousand or two kilometres to bed in, it will get better and easier to drive as it beds and you get used to it. Shaheenis wrote: Well I ended up with a Exedy HD - by accident. In the end I actually decided on a standard clutch but the workshop stuffed up and fitted a Exedy HD which I didn't find out until the job was done. That was 3 weeks ago and I am used to it now but all I can say is it is heaps heavier than stock with very short pick-up and when I drove out of the workshop I hated it (and stalled it). Same material as OEM Exedy, just 40? pound more spring pressure = a lot. It is actually good to drive now but requires more control when balancing the clutch at take off and slow speeds - reversing hills etc. No shudder, noise or anything negative besides how heavy it is. On a positive note when it clamps that clutch aint slipping. Yeah I am used to it now but 30% is a big increase. For a daily I still prefer the feel of the OEM clutch but getting used to it wasn't as big deal as I first thought. I am 500ks in.